Keiko has never really fitted in. At school and university people find her odd and her family worries she’ll never be normal. To appease them, Keiko takes a job at a newly opened convenience store. Here, she finds peace and purpose in the simple, daily tasks and routine interactions. She is, she comes to understand, happiest as a convenience store worker. 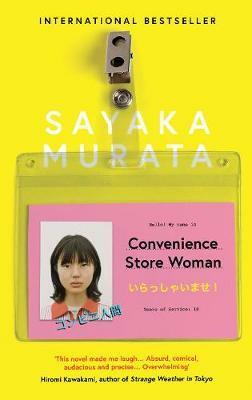 A best-seller in Japan, and the winner of the prestigious Akutagawa Prize, Convenience Store Woman marks the English-language debut of a writer who has been hailed as the most exciting voice of her generation. Since the age of 18, narrator Keiko has worked part time in a 24-hour Tokyo convenience store. Often baffled by societal norms, Keiko appreciates the order that the shop brings to her life; the strict rules of corporate retail at the Hiiromachi Station Smile Mart, and the rhythms of its theatre of commodity exchange, give her ways of fitting in to society that she can understand … or so she thought. At 36, and now well past the age at which women are expected to have found a ‘real job’, or ‘settled down’ and procreated, she is facing increasing inquiries from friends and relatives into her status as unwed, child-free and still working an apparently dead-end job. Keiko needs to rethink her approach, and the result is an intimate journey with this endearing ingénue as she tries to find a way to allay the incessant intrusive questioning of her lifestyle and, along with that, her reason for being. I really loved this book, a bestseller in Japan, with its insightful and astute depictions of working life in a shop. The author is a winner of the Akutagawa Prize, and works part time in a convenience store herself: the affection she shows for this labour is palpable. Like much of the Japanese fiction that I’ve read, the translation (written by Ginny Tapley Takemori) offers up prose that is simple and spare, while opening a window onto a complex emotional, social and political world. The intersections of commerce and personhood, ideology and resistance, are richly explored here, with the setting of the shop operating as both well-drawn observation and perfect metaphor for the experience of life in our times. This feminist take on the roles we assume – or find ourselves playing – is precise, and also heartbreaking. Alison Huber is the head book buyer at Readings.